I really have problems memorizing Korean names. thank you for this simple yet concise character guide! is it just me or s1c4 is not fully translated? and chapter 5 too...please correct me if i'm wrong..
Admin, could you also post the detailed profiles of the characters? Like their heights, blood types etc. :D Thanks a lot! I love everything from this story........................ <3 <3 <3 for the 3 main characters. Hoping for another seasons ahead this year. 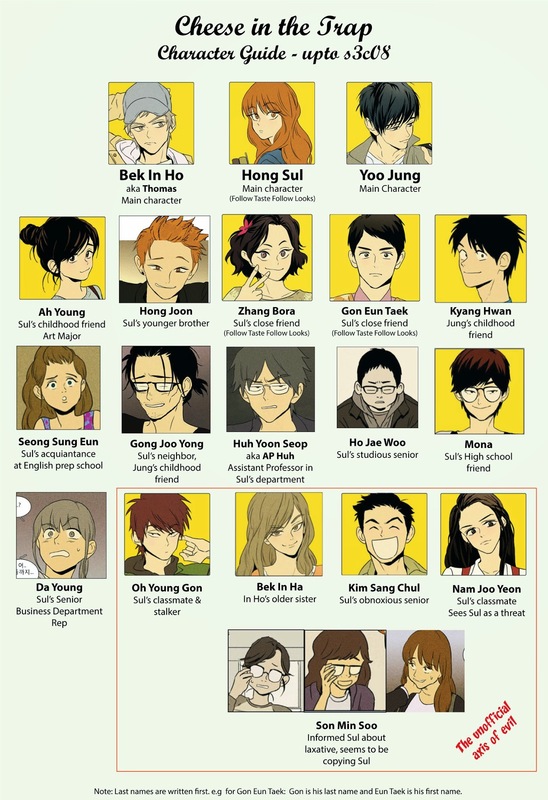 Haha... the 'unofficial axis of evil'... the antognonist is the special thing from this manhwa they are keep growing and smarter in each episode but they still reasonable, is like im reading action not romance story. Thank you for this list!!!!! They made a drama out of this and it is so amazing! Watch it you guys. Thanks so much for this! A huge THANK YOU for your hard work, I'm beyond happy about finding out your website, the English translations and newest chapters of Cheese in the Trap! I'm so hooked on it... You guys rock! :) Keep up the excellent work!